In Firefox, after searching for some keyword in Google and getting a list of results, I would like to copy the link address of a particular result. But I find that the link address is not the actual address, but some modification by Google to include some information about Google itself. 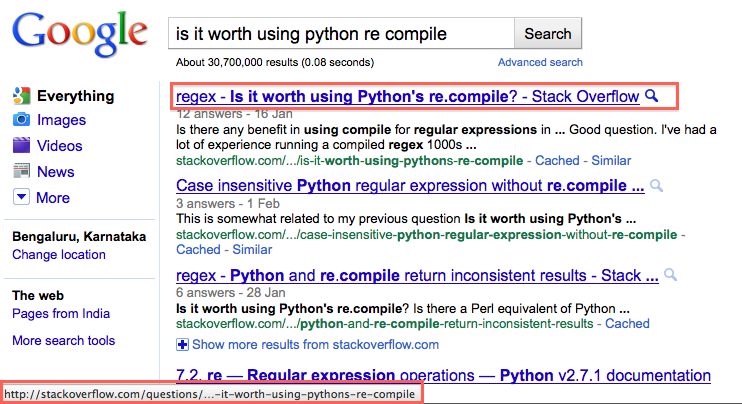 For example, search "regex Is it worth using Python re.compile" in Google, and the first result is "regex - Is it worth using Python's re.compile? - Stack Overflow" whose address is https://stackoverflow.com/questions/452104/is-it-worth-using-pythons-re-compile. But I wish to get just https://stackoverflow.com/questions/452104/is-it-worth-using-pythons-re-compile. I remember Google search used to work in the same way as I wish, but now it has changed. I was wondering if I am missing something and how to do as I wish? There's a Greasemonkey script that can change the Google Search result links back to direct links, then you can simply copy and paste them like normal links on the web. Simplest method without scripts or any other troublesome stuff. Tried and tested in Firefox and Internet Explorer. Reload/refresh the page (F5) (because Step 2 will work only if you haven't already clicked the link). "Right-click and hold" on some empty space away from the link. Move your mouse pointer (with right button still depressed) over the link. Release right-click and select 'Copy link location/shortcut'. The actual link location is located directly below the link description. You could copy and paste it from there. I assume the added stuff is so that Google can log when others are accessing that site link. If the problem is the link length, you could try using a URL shortening service. There's a Greasemonkey Script that will disable what you're talking about. 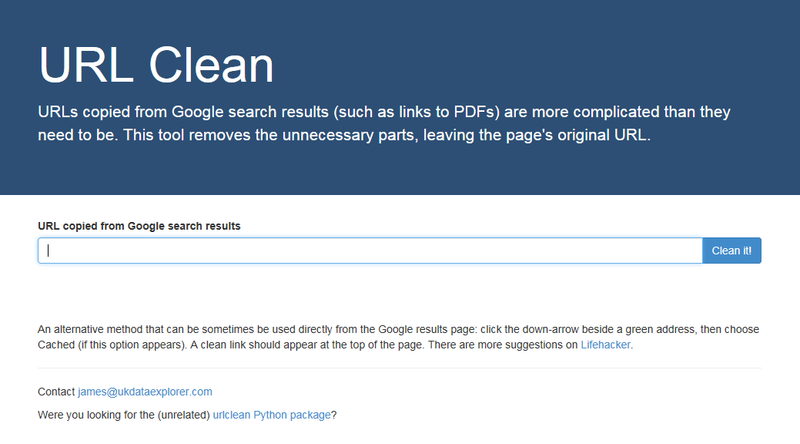 You insert the copied link from Google results and get clean URL without Google redirection code. If you click on the result, and open such a page, you will see that the address bar in the top of your browser (where it says http://*), the address will also change to http://www.python.org/. You can copy the address from there. What Ryan said is also true, but the problem is that google also shortens links (ex: "nl.wikipedia.org/.../Python_(programmeertaal)"). In Chrome Win7X64, right clicking whitespace away from a link, and releasing that click over the link, worked perfectly for me on a lengthy .ppt, just as suggested by benczur. You can simply right click on your mouse and click on "inspect element" (on Google Chrome) and your full link will appear somewhere (you can hit Ctrl + F and enter some keywords of your link to find it quickly). In html code you will see the proper link that you can copy/paste where you need it. You can also use the scroogle site (http://www.scroogle.org/cgi-bin/scraper.htm) which is primarlily aimed at "google privacy concerns", bit a side effect is it produces direct links. Scroogle is occasionally "broken"/doesn't work, mostly after google adds some innovation that changes the way it works. It also won't give you the same answers as google, if your results have geographic weighting, or other non-generic search order issues. I thought this may be dependent whether you are signed in to Google or not. But it is not. The behavior is the same. Benczur's answer has been the simplest one for me to use, without extra tools needed, but as pointed out, in recent versions of Firefox (in my case it's 35.0.1) a context menu pops up right after clicking the mouse left button, not after releasing it, so the trick doesn't work anymore. However, you might consider another simple "hack" to overcome this. Just activate the inspector tool (Shift+Ctrl+C shortcut), then right-click on a given link within Google Search results and select Copy Link Location. Because you've got the inspector tool activated, it would prevent Google's script from replacing original link's location with their own. For Firefox, the Copy Real Url plugin solves the problem for me. Firefox, called… yeah Copy Real URL. Yet I am still looking for a Safari version! Find the link that you would like to copy. At the end of the green incomplete link that you want, click on the down arrow. The top of the page should say "This is Google's cache of..." followed by the url you want to copy. Just right click that url to copy it and you should have the link. It's an extra step, but hey, at least it works. Not the answer you're looking for? Browse other questions tagged google-search links or ask your own question. Why doesn't Google Instant work for me? How can I do a Google site search with a partial URL?